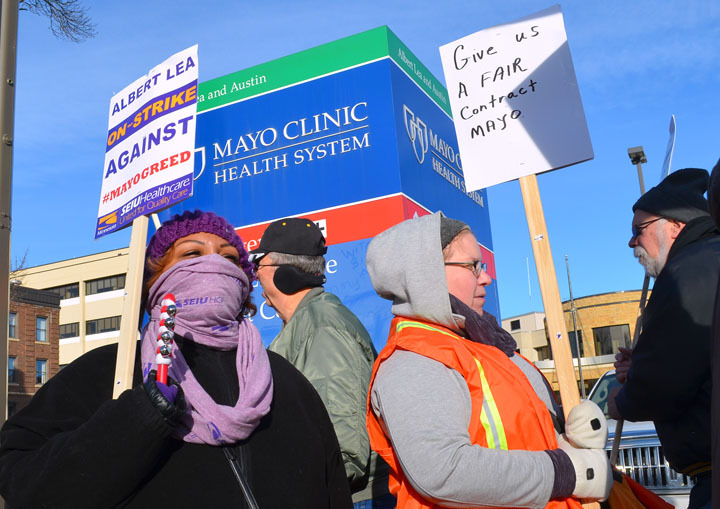 ALBERT LEA – Minnesota’s largest hospital system has picked a fight with two of its smallest bargaining units, but union members at the Mayo Clinic Albert Lea hospital aren’t backing down in their fight for job security and quality rural health care. Workers aren’t standing alone against the health care Goliath, either. Nursing assistants, housekeepers, maintenance staff and other frontline workers at the Albert Lea hospital staged the first-ever strike at a Mayo Clinic facility today. Their picket line swelled with community supporters, members of other unions and elected officials. Striking workers are members of SEIU Healthcare Minnesota, which represents two Albert Lea bargaining units in negotiations with Mayo. The one-day strike pulled together members of both units, 85 workers in all. Picket lines went up at 6 a.m. and were scheduled to come down at 6 p.m. The strike, called in response to alleged unfair labor practices, is a legally protected action, and workers hoped to return to their jobs tomorrow, though Mayo has threatened to lock them out for six more days. Jensen and other workers want protections for local jobs and contract language to prevent further erosion of rural health care in southern Minnesota. Workers have reason to be wary of potential outsourcing at Mayo, which last year handed over its food service operations to a subcontractor from Atlanta. Mayo negotiators, meanwhile, want to strip workers of their right to “negotiate over pensions, over benefits, over disability plans, over paid time off,” SEIU Healthcare Minnesota President Jamie Gulley said. At picket-line rallies throughout the day, speakers decried an increasingly corporate feel in Mayo’s expanding network. State Rep. Tina Liebling, whose district includes Mayo’s headquarters in Rochester, said the hospital’s nonprofit status should mean more than an exemption from paying taxes. “Mayo needs to understand that … it has to be about the people that it serves, and that includes the people who work for it, who give Mayo its soul,” she said.